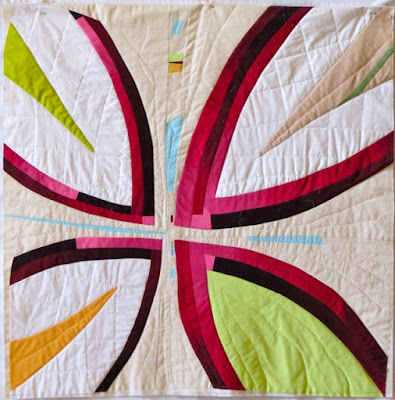 Bias Petal Play by Marion Shimoda, 2014, 36.5"x36.5"
Welcome to my post for The Improv Handbook for Modern Quilters - Test Quilter Blog Hop. This is the story of the test quilt I made for the book. 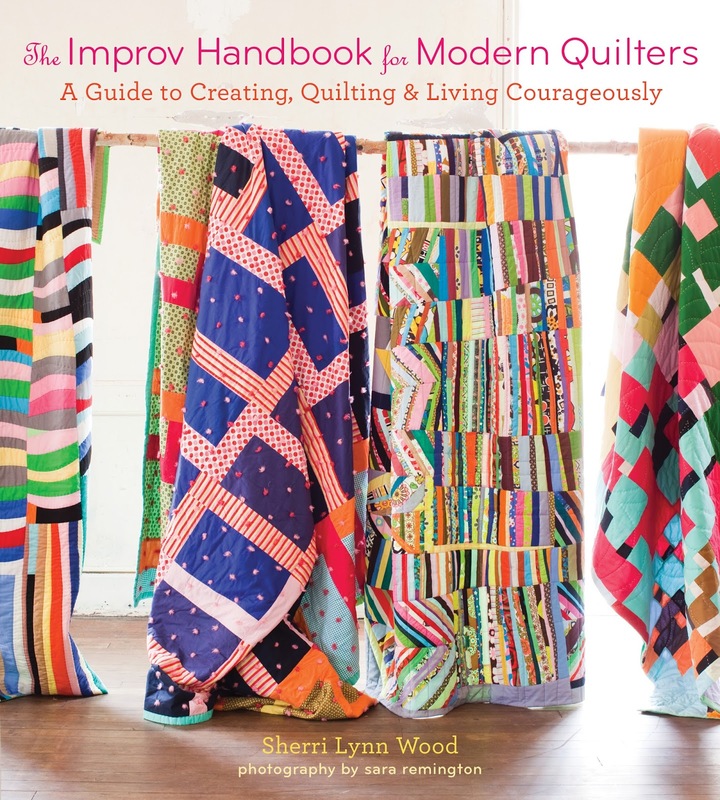 In January 2014, I heard from my friend Kristin Shields that Sherri Lynn Wood was looking for test quilters for her book, the Improv Handbook for Modern Quilters. I wasn't familiar with Sherri Lynn and not clear on what improv or modern quilting was, but thought it would be fun to be a tester. I signed up as a test quilter and on January 16th was assigned to test the Bias Strip Petals score. Submissions for the book were due March 25th. The timeframe for making the quilt was a bit ambitious for me. 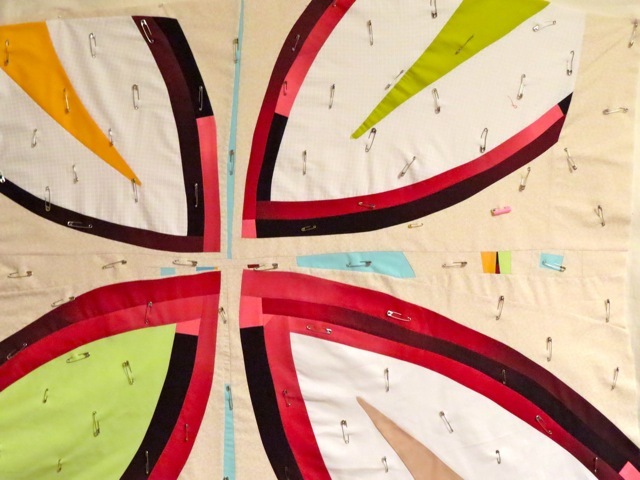 To improve the chances of finishing the quilt in time, I decided to limit the size of my quilt and palette of colors. The finished quilt minimum size was at least 36" square. My target was 36" - 40" square. For bias strips I wanted variation, but few fabrics, to simplify the decisions to be made later when using the bias strips. Bias strips were made from a single piece of fabric designed by Katie Pasquini Masopust for Marcus Brother Textiles, Inc..
Sherri Lynn's method for making the bias strips was quick and easy. Bias strips in hand, I sketched various placements of petals. 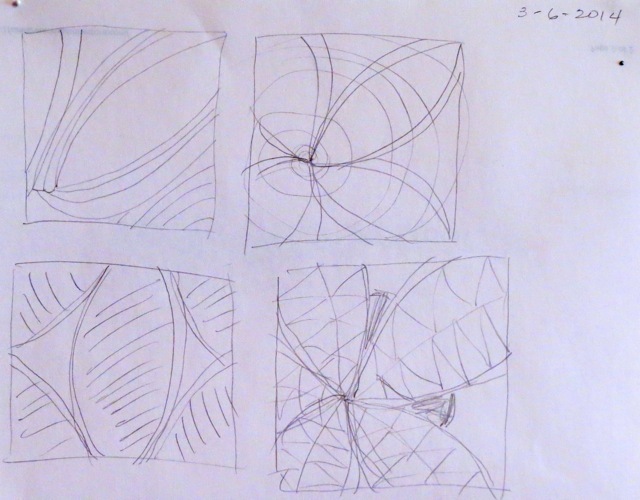 I chose a configuration of petals with an offset center. White and green fabric was chosen for the petals and neutrals for the background. Each petal was assembled separately. During the process of constructing the petals, I cut into and appliqued colored wedge inserts into the three white petals. Sherri Lynn's hints for addressing challenges with using bias strips for curved piecing were very helpful. The resulting petals looked good to me. Next, the petal sections were pieced together. 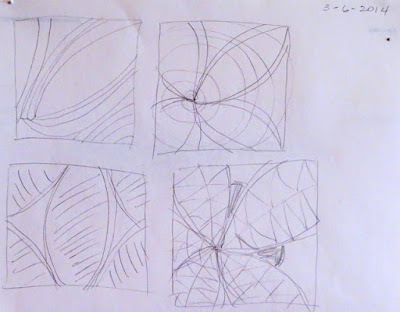 I had planned to make the petals meet at the center as in my sketches, but as I was piecing them together they wanted to move apart. 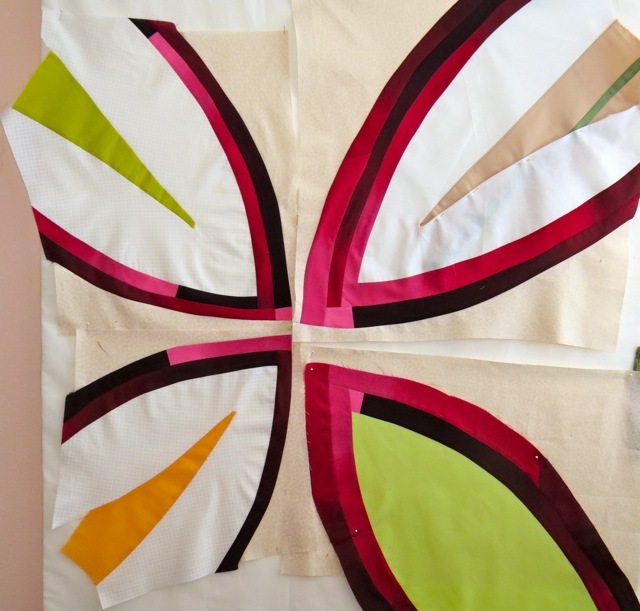 I added strips and bits of color between the petals using methods I learned from studying with Gwen Marston (Liberated Quilting) and Jean Wells as I moved the petals apart. The piece was hand quilted. Patches of color were added along edges where the quilt top had shrunk during piecing and quilting. A thin white binding and wool applique were the final touches. Bias Petal Play was submitted on March 25th. It was selected to be included in the book and appears on page 95. 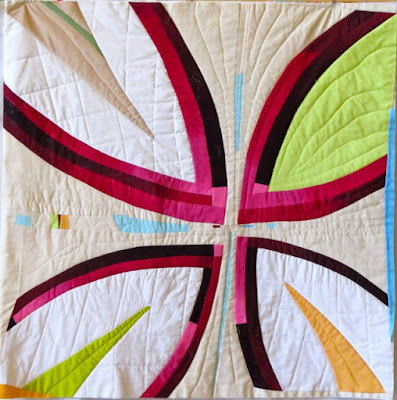 It was also juried in to QuiltCon 2015 and was sold there. Being a test quilter was a challenging and educational experience. It was a good chance try something different while applying techniques and methods I use in my work. I learned some new techniques and that I am an improvisational quilter. Thank you Sherri Lynn for the opportunity to participate as a test quilter for your book. 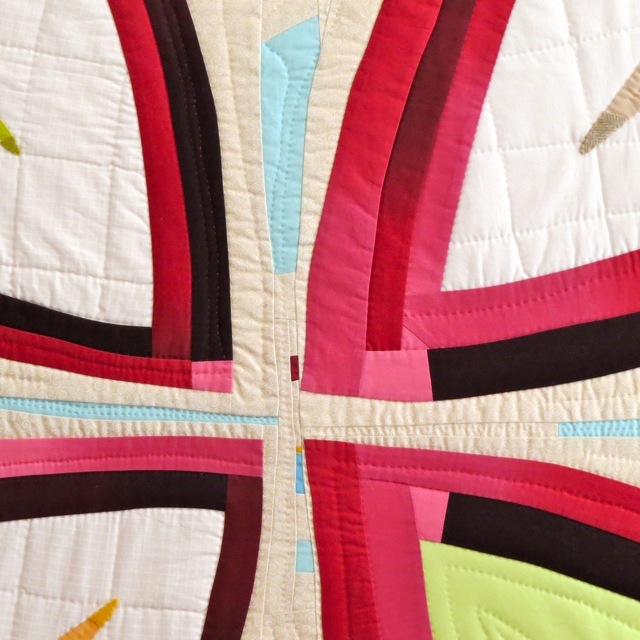 I am enjoying seeing the quilts and reading about the experiences of others making quilts based on the scores in the book. I look forward to exploring the scores and using the techniques presented in the book and encourage others to join me in doing so. 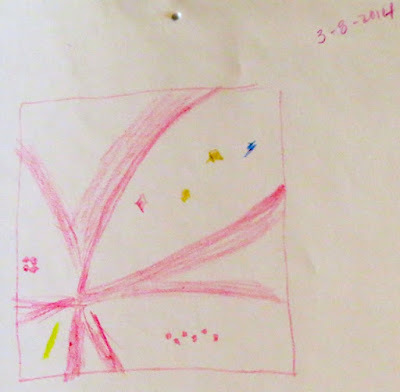 For a list of other stops on the blog hop, click here. What an opportunity! Love your process and that it was in Quiltcon and the book. Great story Marion! I'm glad I got to share that moment with you when the QuiltCon people tracked you down to say that someone wanted to buy your quilt. Knowing you have someone who wants your work always feels good! Marion you are so incredibly talented and it is so cool that your work is featured in a book I so love (Improv Handbook)! Hi Marion! 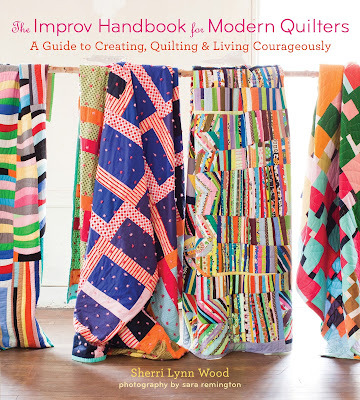 Just started browsing through this amazing book because I signed up for QuiltCon today and am taking Sherri Lynn's class based on a chapter in this book. I was so excited to run across your name in the credits! We met in February in Pasadena at the BIQR dinner! Hope to see you in Savannah.